I cried -- my sobs not easily muffled. In the cramped airline seat I wept, hoping the woman next to me wouldn't notice. Damn Elizabeth Flock. No, Elizabeth Flock wasn't my seat mate. Elizabeth Flock is the author of the novel I just finished. I'd read a review of the book in the Denver Post and I contacted the publisher for my own review copy. Sleepwalking in Daylight is a suburban everymom story told by Samantha, a SAHM who endured infertility and adoption and who now parents a teenage girl (via adoption) and twin 8 year old boys (via IVF). She and her husband, Bob, have lost all connection with each other, and Samantha finds intimacy with another man she meets in a Starbucks. This new connection fills Samantha's void and consumes her. Alternate chapters are told by Cammy, Samantha's 16 year-old daughter. Cammy was born addicted and placed for adoption by her birthmother at age 2. Bob was never on board with the adoption, and he later told Cammy of her adoptedness in a scarring fashion. Cammy's parents are self-absorbed and unhappy, her twin brothers have each other, and she spirals down into a morass of drugs and debasing activities. What this book is not: great literature, complicated, deep, lengthy. What this book is: hard to put down, heartbreaking, and, I would venture, controversial for those in the adoption triad. Some adoptees will be incensed with the way Cammy is portrayed; some will point to the Primal Wound and say, "See?" Some birthparents will claim the firstmom was portrayed as stereotypical and inconsequential. Most adoptive parents will shudder at the parenting issues, inextricably entwined with adoption issues. The literary technique called chiasm is present in Cammy's adoption story. In between, there are roads not taken. What would her life had been like had her firstmom not placed her? Surely better, she is certain. Samantha faces her roads not taken, too. What if she hadn't pushed Bob so hard to adopt? What if she'd eased up on this particular (and shady) adoption? What if she had remained child-free? Would any of these routes have taken her to a happier place, where she was actually awake in her life? "I did some research on at-risk teens, mostly by reading recent articles online. But I'd be lying if I said I did much more than that. I simply tried very hard to imagine what it would feel like to be Cammy. Feeling as if she didn't fit in her own family. It's hard enough for teens to try to fit in at school with their peers but at home Cammy was also desperate for a connection that was ever so slightly out of reach. I felt incredibly sad for her. I think we all have a little Cammy in us, even if it's just a tiny bit. I tried to tap in to that." This is Elizabeth Flock's fourth novel. She tells a good story in a real and conversational way. Her pre-novelist life was as a journalist for People and Time magazines. In spite of the tears, I give this book a thumbs up. 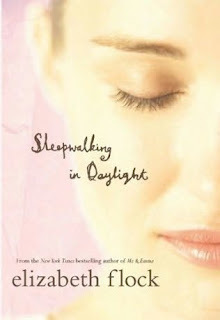 Sleepwalking in Daylight is billed as a book about marriage, but it also spoke volumes to me about parenting. The story reminds me to try and see life through my children's eyes -- and serves as a warning to keep me from sleepwalking through these parenting years. This book sounds awesome. Sometimes I don't want a deep read, just something emotional that makes me re-think things. All I can say is I acknowledge all you wrote here. I don't think I can read it. Added to my TBR list but I don't think I can handle it right now. Give me a couple of months - I haven't recovered from reading Silent Sorority and will have to read Melissa's book soon.